The Fall 2010 Concordia Journal is at the press and should be in the mail shortly. 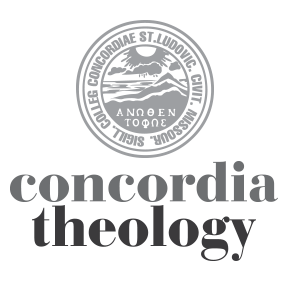 The Homiletical Helps from the Fall issue are already available here at concordiatheology.org. ….Try as we do, and people are trying hard to get things going, we are up against cultural changes the likes of which we haven’t seen in our lifetimes. On top of that, we are prone to kill our wounded. Unofficial print and blogs within our fellowship are often ill-informed and sometimes slanderous. The “Progress Report of the Task Force on Synodical Harmony,” distributed in the workbook leading up to last summer’s synodical convention in Houston, identified seven aspects of the LCMS that contribute to our sadness: “Inability to deal with diversity, a lack of civility, a politicized culture, primarily a clergy problem, poor communication across ‘party lines,’ lack of accountability, and distrust.” I have a grade school classmate, one of the smartest in our class, who told me she had had enough and left the LCMS…. Designed first of all to meet particular needs of the church in distinct situations, the Lutheran Confessions served the function of guiding the church so effectively in those situations that they were taken not only as prescriptions for public teaching but also as models for the way in which the Wittenberg reformers thought theological processing of the biblical message should be formulated in other, future situations… Therefore, their doctrine of the church is lean and clean in the Book of Concord. Nonetheless, it offers a sufficient basis for applying what the Wittenberg reformers believed are the essentials of God’s will for the assembly he gathers through his Word in every age. It enables believers to understand who they are and what he is doing with and through them as his church throughout history…. Out of the ecumenical movement came the phrase, “Doctrine divides, but service unites.” It has been a rallying cry in ecumenical circles at least since 1925. When the attempt to pool missionary resources for the preaching of the Gospel was hindered by the confessional stances of some churches, the ecumenical movement turned to diakonia as a means of unity. If doctrine or theology might prevent two different denominations from sharing a missionary or preacher, what theological or doctrinal objection could be raised to different denominations sharing resources in order to dig a well or to establish a medical clinic? If the unity of the church could not be seen in preaching and teaching, perhaps it could be seen in diakonia—in works of service and mercy….